Are the “great earthquakes” about to happen? The Last Chronicle of Planet Earth” Aug. 30, 2011 Edition is now ready for you to download for free. Please note, the download may take some time to download but it will come up. The speed will depend on your computer. This is what I wrote you on my May 17, 2010 post: “For the past month or so I have been posting a lot of information about the signs of the Psalm 83 war and the Ezekiel 38 war as outlined in the Bible. In my prayer time this morning I had the distinct impression Jesus wanted me to warn you about some major shaking that is coming very soon. To be honest, I am not sure if this shaking is from the Earth, or whether it will be man made such as a great shaking from a bomb. The last time I had an impression like this China, and Japan had huge earthquakes within 3 days. One thing that has also been placed on my heart is the warning found in Mark 13:8, which I have covered recently in many of my posts. This is the sign were Jesus warns us the events taking place on Earth will happen as a women with birth pains. I can not shake the feeling that these birth pains are really going to intensify shortly. I watched the videos below, and while watching them it was almost as if I was with Christ standing next to the people in these videos. It was if He wanted me to focus in on what they were saying, and how they were reacting while the shaking was going on. I became very uncomfortable because I knew all of these people were caught off guard. I heard people use Jesus name, and I heard a women say she thought this was the end of the world. We are in for some more huge earthquakes so remember who it was who told you they were coming. It wasn’t Frank DiMora, it was Frank quoting from the Word of God. As you can see from the videos below we have already seen some pretty bad quakes this year already, but more are coming. I want to leave you with this Word from God. “"This is what the LORD Almighty says: 'In a little while I will once more shake the heavens and the earth, the sea and the dry land” (Haggai 2:6).” End of quote from my May 17, 2011 post. As I continue to study and pray about the events which are suppose to occur during the month of September I am beginning to get the sense that we will be seeing some of these great earthquakes Jesus has warned us about very soon. I know Comet Elenin is coming, and I know that this comet as it lines up with the planets and Earth may cause some huge quakes, because of the electricity pull. As Elenin moves closer to us take note of the following dates just in case. Sept. 5 and 6th, September 11th, September 27-29th, and Oct 17, 2011 when this comet will be the closet to Earth. We have already seen a pattern of quakes in the past from Elenin so as this comet gets closer it could give us quakes higher than a 10 magnitude. Knowing what we see from Ezekiel 38:16-20 I am expecting a quake much higher than a 10.0. The bottom line is this, Jesus forewarned us about these “great earthquakes” so what makes you think we won’t see them? A magnitude 5.4 subsea earthquake struck along the Northern Mid-Atlantic Ridge on Wednesday, according to the European-Mediterranean Seismological Centre. The earthquake was recorded at a depth of 10km and was located just over 500 kilometres from the Azores. The quake occurred at 1:17 PM GMT. The Mid-Atlantic Ridge (MAR) is a mid-ocean ridge, a divergent tectonic plate boundary located along the floor of the Atlantic Ocean, and part of the longest mountain range in the world. It separates the Eurasian Plate and North American Plate in the North Atlantic, and the African Plate from the South American Plate in the South Atlantic. Prophecy Sign: Daniel 12:4 you will find that one of the last days signs is knowledge would increase. Here is an example of this increased in knowledge.
" Technology has threatened many jobs with extinction in the last few years: travel agents, thanks to Expedia; translators, thanks to Google; waiters, thanks to the iPad. But positions that involve a smile, a warm greeting, and a reassuring glance are less under threat, one would think. You'd be wrong. At one French airport, your friendly boarding agent has gone virtual." 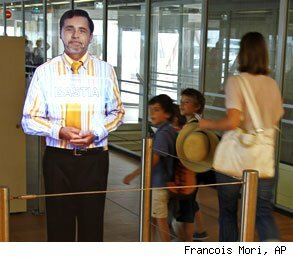 At one gate in Paris' Orly airport, you may be greeted and wished a bon voyage by a hologram, rear-projected onto human-shaped plexiglass. The pilot project currently exists only at Hall 40, which sees 30 or 40 flights a day and around 1 million passengers a year, reports The Associated Press. It's part of Orly's attempt to modernize the gate. The audiovisual marketing company L'Oeil du Chat ("the eye of the cat") filmed three human boarding agents to create the startlingly real projections. "Children like it, it's fun. They're attracted to it and try to play with it," Didier Leroy, the airport's director of operations, told AP. Apparently very few "find it useless or just a gizmo." You will find out from reading my post today that this September may be a period of time that many events take place that could fulfill many prophecies. I know many of you are asking about the Comet Elenin or what many call, Nibiru Planet X. I was given a video for you to watch that will help you understand what is suppose to happen during the time of the Feast of Trumpets this September. Prophecy Sign: Matthew 24: 37-39 concerning what the last generation would be like just prior to His second coming. In verses 37-39 Jesus shows us our generation would be just like that of Noah’s. This generation turned from God and followed their own lusts and became evil people. We know part of Noah’s generation troubles came on them when they turned to homosexuality. How do we know this? Notice that Jesus compared Noah’s day to Sodom and Gomorrah and then linked it to the time of his return. I quote our Lord. Luke 17: 25-30. “But first must He [Christ] suffer many things and be rejected by this generation. 26And as it was in the days of Noah, so shall it be also in the days of the Son of Man: 27They ate, they drank, they married wives, they were given in marriage, until the day that Noah entered into the ark, and the flood came and destroyed them all. 28“Likewise also as it was in the days of Lot: They ate, they drank, they bought, they sold, they planted, they built; 29but the same day that Lot went out of Sodom, it rained fire and brimstone from heaven and destroyed them all. 30“Even thus shall it be in the Day when the Son of Man is revealed.” Lot was living in a city that was full of people who had turned to homosexuality and what happened to that city? God wiped it out! This in itself should tell you something. Look, if Christ warned it would be this way again, and we are seeing it actually spread around the world, what part of the last days signs can’t you see? This is the bottom line to what I am saying. Just because I am pointing out what Jesus has warned us about the gay movement doesn’t mean I dislike the gays. Fact is, if you love Jesus you should love all people just as He did, and that includes those people in our generation who have taken up the practices Jesus warned about in Noah’s generation and those of Sodom and Gomorrah. When I report on this subject it is to show you that the time in which Jesus warned us concerning what people would be like just prior to His coming has arrived and it is exactly as Christ said it would be. I know there are people who call themselves Christians who hate the gays and lesbians, but hate comes from Satan not from Christ. It is one thing to hate the sin, but it is another thing to hate the person. A true Christian who is abiding in Christ will pray for the people who have taken the life style Jesus warned about in Noah’s time, and Sodom and Gomorrah. There are signs every where showing us Jesus’ words have come to pass and here is one of those signs. What breaks my heart is this. When a person willfully sins against the Lord and rejects Him as His savior that tells us this type of person will soon have to face the seven year tribulation. According to Christ in John 14:6 no one will go to the Father unless they go through the Son Jesus Christ. Look, my prophecy book is based solely on facts, and the fact is, the way Jesus said it would be has taken place in our generson so I repeat Jesus words in verse 30“Even thus shall it be in the Day when the Son of Man is revealed”. Prophecy Sign: Christ gave us very specific details what would happen in the last generation which would see Him return. The sign of Noah’s generation and Sodom and Gomorrah was very detailed. It was detailed for us so we would know without a doubt that the savior Christ Jesus was just about to open up the door to heaven and remove all those who have received Him as the Lord. The warning concerning the Psalm 83 war is another one of those very detailed events that would happen in the last days. I’m not going to spend much time on this prophecy today as I gave you many reports yesterday showing you the path to this Psalm 83 war is being laid out. As a child of Christ, the spirit within me cries out to warn as many as will listen concerning these last day signs. You may not believe this, but news like you are about to read next is a very specific sign that the nations listed in the Psalm 83 war are getting ready to fulfill the Lord’s warning about this battle. Why am I telling you this? I know many of you reading this today are up set that your family members are not saved yet. I know many of you have family members who call you crazy and laugh at you for telling them the Lord’s last day signs. I know that many of you have lost friends, and family members because you have brought this subject up. However, I also know that God’s promise in Isaiah 55:11 will be done. Since 1977 most of my friends and family members who once laughed at me, now have seen with there own eyes everything I warned them about has come to pass and they have received Jesus as their Lord. Those words I sent out via God’s Word stuck to them all like a fly on fly paper. Nothing they could do could shake off the Lord’s Words and in the Lord’s timing just as it says in verse 11, “it shall not return to me empty, but it shall accomplish that which I purpose, and shall succeed in the thing for which I sent it.” Lift up your hearts today and rejoice in this promise for the day is coming when each person you spoke with will be face this promise. Let the Lord do His work, your job is to speak that Word! 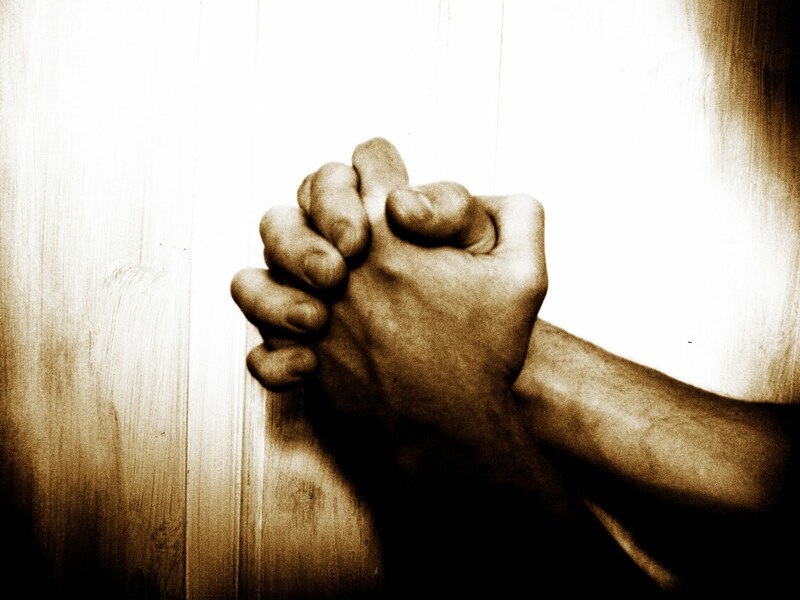 After you send forth His Word, pray and do not give up until the person you are praying for is saved? Stop your worrying and live a joyful life in Christ. Jesus is well aware of how much you love your family and friends and is working on your behalf. Here is one fact that you all should take hold of. Israel’s enemies are looking for a fight with Israel. This is my own take on what is happening. The PLO will step up their attacks the closer they get to their meeting with the UN during the Feast of Trumpets. I believe they will do this to bring world attention to how bad Israel is in the hope that the world will take sides with them in the forming of a new PLO State inside Israel. Since Zechariah 12:3 warns that all the nations of the world will come against Israel in the last days, I am sure this is how the news media is going to portray Israel. As I said before, September is going to be a very interesting month to say the least! Signs of the Times: Ezekiel’s Prophecies Set to Unfold? Watch video. For the past two years Israel’s leaders have warned they would attack Iran to wipe out Iran’s nuclear plants if the UN, the US, or the EU did nothing to stop the Iranians from obtaining a nuclear bomb. No one has been able to stop Iran’s quest to get their hands on a bomb that would be used to destroy Israel. This is the reason why the CIA agent has warned Israel will start a war with Iran. As you saw from my report yesterday Aug, 30, 2011 both Israel and Iran are moving war ships toward Egypt. I truly believe Prime Minister Binyamin Netanyahu will carry out his promise to take out Iran’s nuclear plant. I can assure you Netanyahu knew about the news you are about to read before it came out. “Iran has acknowledged that it possesses new technologies that could bring it closer to developing nuclear weapons and more advanced missiles. The international community is finding it more and more difficult to restrain Tehran, and increasing the country's political and technological isolation could have dire consequences.” In another section of this report the writer gives facts as to how Israel dealt with these nuclear problems in the past. “Israel took full advantage of the situation. In 1981, Israeli bombers destroyed Iraq's Osirak reactor at the Al Tuwaitha Nuclear Center near Baghdad during Operation Opera. Analysts say the Israeli strike virtually halted the entire Iraqi nuclear program. In September 2007, Israeli warplanes hit an unspecified facility in Syria. Some reports claim that the facility was part of Damascus' nuclear program. Both air strikes accomplished their objectives. The nuclear weapons programs of Arab regimes unfriendly to Israel slowed down considerably. However, sending in the cavalry against Iran will not have the same success. Israel is unable to mount such an attack on Iran, and not because of the distance between the two countries. In 1976, for example, Tel Aviv conducted a spectacular hostage rescue operation at Entebbe Airport in Uganda. That was an extremely difficult objective because Israeli special forces had to be illegally redeployed over the Red Sea, Somalia and Ethiopia's Ogaden Desert. As I see it there is no way out of not doing something to halt Iran’s progress in getting their hands on a nuclear bomb. In Matthew 24:7 Jesus said there would be wars and rumors of wars. War is coming! These are the events that is leading the people of Planet Earth to see God’s Word completely fulfilled. As it was in 1977 when I warned about so many prophecy signs that have since been fulfilled, God’s Word never fails and soon you will this prophecy fall in line as the other have. Most of the worst financial panics in history have happened in the fall. Just recall what happened in 1929, 1987 and 2008. Well, September 2011 is about to begin and there are all kinds of signs that the financial world is about to hit the big red panic button. Wave after wave of bad economic news has come out of the United States recently, and Europe is embroiled in an absolutely unprecedented debt crisis. At this point there is a very real possibility that the euro may not even survive. So what is causing all of this? Well, over the last couple of decades a gigantic debt bubble has fueled a tremendous amount of "fake prosperity" in the western world. But for a debt bubble to keep going, the total amount of debt has to keep expanding at an ever increasing pace. Unfortunately for the global economy, sources of credit are starting to dry up. That is why you hear terms like "credit crisis" and "credit crunch" thrown around so much these days. Without enough credit to feed the monster, the debt bubble is going to burst. At this point, virtually the entire global economy runs on credit, so when this debt bubble bursts things could get really, really messy. Sadly, this is a cycle that can feed into itself. When credit is tight, the economy slows down and more businesses fail. That causes financial institutions to want to tighten up things even more in order to avoid the "bad credit risks". Less economic activity means less tax revenue for governments. Less tax revenue means larger budget deficits and increased borrowing by governments. But when government debt gets really high that can cause huge economic problems like we are witnessing in Greece right now. The cycle of tighter credit and a slowing economy can go on and on and on. At this point the EU essentially has three choices. It can choose much deeper economic integration (which would mean a huge loss of sovereignty), it can choose to keep the status quo going for as long as possible by providing the PIIGS with gigantic bailouts, or it can choose to end of the euro and return to individual national currencies. Any of those choices would be very messy. At this point there is not much political will for much deeper economic integration, so the last two alternatives appear increasingly likely. The following are 25 signs that the financial world is about to hit the big red panic button. #9 According to Bloomberg, since World War II almost every time that the year over year change in real GDP has fallen below 2% the U.S. economy has fallen into a recession....Since 1948, every time the four-quarter change has fallen below 2 percent, the economy has entered a recession. It’s hard to argue against an indicator with such a long history of accuracy. #10 Economic sentiment is falling in Europe as well. The following is from a recent Reuters article....A monthly European Commission survey showed economic sentiment in the 17 countries using the euro, a good indication of future economic activity, fell to 98.3 in August from a revised 103 in July with optimism declining in all sectors. #14 Political wrangling in Europe is threatening to unravel the Greek bailout package. In a recent article, Satyajit Das described what has been going on behind the scenes in the EU....The sticking point is a demand for collateral for the second bailout package. Finland demanded and got Euro 500 million in cash as security against their Euro 1,400 million share of the second bailout package. Hearing of the ill-advised side deal between Greece and Finland, Austria, the Netherlands and Slovakia also are now demanding collateral, arguing that their banks were less exposed to Greece than their counterparts in Germany and France entitling them to special treatment. At least, one German parliamentarian has also asked the logical question, why Germany is not receiving similar collateral. #15 German Chancellor Angela Merkel is trying to hold the Greek bailout deal together, but a wave of anti-bailout "hysteria" is sweeping Germany, and now according to Ambrose Evans-Pritchard it looks like Merkel may not have enough votes to approve the latest bailout package....German media reported that the latest tally of votes in the Bundestag shows that 23 members from Mrs Merkel's own coalition plan to vote against the package, including twelve of the 44 members of Bavaria's Social Christians (CSU). This may force the Chancellor to rely on opposition votes, risking a government collapse. #18 If something goes wrong with the Greek bailout, Greece is financially doomed. Just consider the following excerpt from a recent article by Puru Saxena....In Greece, government debt now represents almost 160% of GDP and the average yield on Greek debt is around 15%. Thus, if Greece’s debt is rolled over without restructuring, its interest costs alone will amount to approximately 24% of GDP. In other words, if debt pardoning does not occur, nearly a quarter of Greece’s economic output will be gobbled up by interest repayments! #21 Once the European crisis unravels, things could move very rapidly downhill. In a recent article, John Mauldin put it this way....It is only a matter of time until Europe has a true crisis, which will happen faster – BANG! – than any of us can now imagine. Think Lehman on steroids. The U.S. gave Europe our subprime woes. Europe gets to repay the favor with an even more severe banking crisis that, given that the U.S. is at best at stall speed, will tip us into a long and serious recession. Stay tuned. #25 Minneapolis Fed President Narayana Kocherlakota says that he is so alarmed about the state of the economy that he may drop his opposition to more monetary easing. Could more quantitative easing by the Federal Reserve soon be on the way? Things have not looked this bad for global financial markets since 2008. Unless someone rides in on a white horse with trillions of dollars (or euros) of easy credit, it looks like we are headed for a massive credit crunch. I have been keeping track of what Pastor Lindsey Williams has said about what the elite are about to do to the US dollar. Watch the video and you will see what he has warned has come to pass just as he said it would. 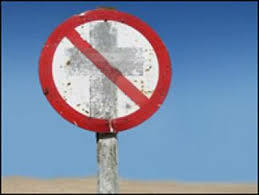 Prophecy Sign: In Luke 21:12 Jesus warns us to look for the sign of Christian persecution in the last days. Matthew 24:9 tells us that Christians will be hated for Christ’s name sake. Below is an example of this persecution. 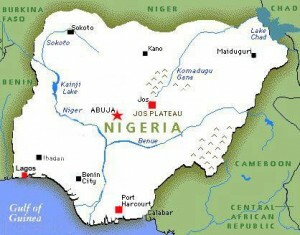 ABUJA, NIGERIA (Worthy News)– Muslim extremists with the alleged aid of Nigerian soldiers killed 24 Christians this month in Nigeria's central Plateau. "They were in army uniform," said Nnaji John, who lost her family in an attack. "I even know some of them: they came along with the Muslims to attack us. I can swear to God Almighty that the attack was carried out with the support of the soldiers. I saw them." Chollom Gyangof Chwelnyap confirmed that the August attack on his neighborhood was supported by Muslims of the Special Task Force. "The attackers were the very soldiers deployed to the area to ensure protection of the people," said Chwelnyap. He said area residents found identification cards of Muslim soldiers as well as pieces of their uniforms in the villages that were attacked. Prophecy Sign: Revelation 6:6 shows people living during the trubulation period will have to work all day long for one small meal. What does this say about the price of food? With all the judgments that will fall during the tribulation most of the food will be wiped out. What happens when there is less food? Prices go up. We are already seeing sky rocketing prices of food and it is going to get much worse. The video below is an example of what I am talking about. “The Last Chronicles of Planet Earth” August 10, 2011 Edition is now ready for you to download for free. Please note, the download may take some time to download but it will come up. The speed will depend on your computer. I am doing my best to up-date my book as much as possible for you in order to give you as much information as I can. It is my prayer that just in case this September is the appointed time for the Lord to rapture His Church that this book will still be available on the net for the people who were left behind. As I said many many times before, no one can tell you for sure if this Feast of Trumpets that falls this year on September 28- the 29th will be the one Christ has choosen to remove all the believers. However, since there is always that possibility it could be, anyone left behind will need the information contained in this book. If by chance the Church is raptured away your going to need to fully understand what your about to face, and what you must now do to enter the kingdom of God. Earlier today I posted many reports showing you the Psalm 83 war is steaming toward the Middle East. As you can see from the photo above Egypt will be playing a major rule in the attack against Israel. One report today that I did not point out was entitled: “Report: Israel sends 2 warships to Egyptian border”. I quote, “Military sources tell AP Israeli Navy sent additional warships to maritime border with Egypt following intelligence indicating viable terror threat. Meanwhile, Iran set to send 15th fleet to area as well as 'to thwart pirate activity'. “The Israeli Navy (INF) has decided to boost its presence and patrols near Israel's maritime border with Egypt due to a viable terror threat in the area. Israeli security sources told the Associated Press on Tuesday that two additional warships have been dispatched to Israel's Red Sea border with Egypt. Another source stressed that the operation was routine, telling Reuters that "two naval craft have been sent to the Red Sea. This is not unusual." Earlier this year rumors begin to fly concerning Israel attacking Iran’s nuclear plants to make sure they never get the chance to develop a nuclear bomb that would be used against Israel. This attack is suppose to take place in September. Could it be that Israel is getting ready for such an attack and Iran thinking that Israel is crazy enough to try it that both nations are jockeying for position before the strike. Maybe Israel is also getting ready for trouble with the PLO when they go before the UN to claim a PLO State inside Israel. One thing is for sure, Jesus warned us in Matthew 24:7 that we would see wars and rumors of war. We have witnessed so many rumors of war this year that it is hard to keep up with them all. I do believe the time of rumors is drawing to a close and now soon we will see war between Israel and all the nations listed in the Psalm 83 war. The Last Chronicle of Planet Earth” Aug. 20, 2011 Edition is now ready for you to download for free. Please note, the download may take some time to download but it will come up. The speed will depend on your computer. 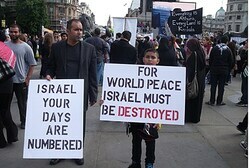 Prophecy Sign: Paul told us that sudden destruction would come at the time when Israel is calling for Peace and safety. I quote 1 Thess 5:3. “For when they shall say, Peace and safety; then sudden destruction cometh upon them, as travail upon a woman with child; and they shall not escape.” Zechariah 12:3 is a prophecy that tells us Jerusalem will be the main problem that all the nations will be dealing with, and anyh nation that comes against Jerusalem will be cut in pieces.” I quote, "And in that day will I make Jerusalem a burdensome stone for all people: all that burden themselves with it shall be cut in pieces, though all the people of the earth be gathered together against it.” When will this destruction come? We know for sure that the Psalm 83 war is approaching very fast, and we can see all the nations listed in Psalm 83 are in the process of getting ready to attack Israel. Just in the past few days we are witnessing signs of all the prophecies I listed above coming to pass. The news you are about to read should be enough to show you what the Lord has warned you is about to be fulfilled. Once again I must remind you that this September, 2011 the 28th & 29th is the Feast of Trumpets. This is the Feast that we know Christ will return to remove His Church before the tribulation begins. What we do not know for sure is if Christ will remove His Church this September? He could return next September or some other year during that feast. However, because of all the events that are suppose to occur this September during the Feast of Trumpets there is a heightened alert to be on the watch for His coming. To read all the things that are supposed to take place this September scoll down at this site and read my Aug. 26, 2011 post. What if Jesus has chosen this September's Feast of Trumpets to come back for His Church? If He came would He find you ready to leave with Him, or would you be left behind because of your unbelief? That brings me to the news today. As I see the exact same things the prophets warned about for these last days concerning the Psalm 83 war, and how everyone is coming against Jerusalem, while they are still calling for Peace and safety, I know in my spirit that we do not have much time left before the Psalm 83 war breaks out. When this war takes place that will be a major sign to everyone the last seven years called the tribulation is about to begin. One of the things I have repeated over and over again at this site was the PLO would never recognize Israel as a State. In my spirit I have always known that part of the reason why the sudden destruction that would come would be because the PLO would not confirm the right for Israel to exist. What the PA Chairman just recently stated, only confirms what the Lord has shown me. Scoll up to the photo with the list of nations and peoples who are going to attack Israel in the Psalm 83 war. Look at #8 and you will find it is the same people who you are about to read about! Not only does this news point to the soon coming Psalm 83 war but it also points to Libya who is also going to fulfill Bible prophecy in Ezekiel chapters 38-39. God tells us in Ezekiel that Libya will attack Israel in the last days. The reason why you are now reading that Libya and the PLO have joined together is because they are going through the motions that will fulfill prophecy. After Israel wins the Psalm 83 war, there will be another war, which we call the Ezekiel war. Can you image how most of the world will hate the tiny nation of Israel when they once again defeat all the nations that come against her in that Psalm 83 war? After the Psalm 83 war is over there is going to be one giant step forward to fulfilling Zechariah 12:3, which is when all the nations of the world will joined ranks against Israel. By now everyone who have been visiting my site on a regular bases should recall all the times I warned you that the PLO would never let up in their attacks against Israel. They will continue to attack until Paul's warning concerning the sudden destruction is completed. Did I mislead you? As you will see by the current news that answer is no! “Defense Minister Ehud Barak warned Monday that Palestinian organizations in Gaza are preparing to carry out an attack similar to the one in southern Israel on August 18, in which eight civilians were killed. Barak, who visited the plant of Israel Aerospace Industries subsidiary Elta in Ashdod on Monday morning, said that “even this morning we are on high alert in the south in the face of the possible attack, which is similar in set-up to the one that happened ten days ago.” On Sunday night, IDF chief Benny Gantz ordered the deployment of reinforcements around both the southern Gaza Strip and the Egyptian border, due to intelligence reports suggesting an imminent attack by Islamic Jihad. The reinforcements were coordinated with the Egyptian army. Although security sources estimate that Islamic Jihad is planning the possible attack, a security official made it clear that the IDF will hold Hamas responsible for any terrorist attack originating from the Gaza Strip." Israel has set in place what is called the Iron Dome. This video from the IDF spokesperson shows the Iron Dome system intercepting a rocket fired from the Gaza Strip. Now that you read this news scroll up to the Photo at the top of today's post and look who #4 is. It is Egypt. Now are you getting the big picture? Our generation is about to witness the Psalm 83 war so get ready to see it on the news!! I warned you the next leader in Egypt would hate Israel and would press for the destruction of the Jewish State. As more news pours in about the new leaders in Egypt my warnings have come to pass, and this new report points not only to the signs of the coming Psalm 83 war, but also the word of Christ in Matthew 24:9 where Jesus tells us Christians will be hated for His name sake. “A rising leader in the radical Islamic movement in Egypt that has become a major political player since the demise of Hosni Mubarak's regime says Christian churches may need to be blown up and Christians exterminated to allow the advance of Islamic law, or Shariah. The comments come from Sheik 'Adel Shehato, a senior leader with the Egyptian Islamic Jihad terrorist group. The sheik was jailed in 1991 because of his positions but was released earlier this year in the revolution that removed Mubarak from power.” "Yes and no," he replied. "The Christian is free to worship his God in his church, but if the Christians make problems for the Muslims, I will exterminate them. I am guided by the Shariah, and it stipulates that they must pay the jizya tax while in a state of humiliation." "These positions of yours frighten us, as Egyptians," the interviewer said. "I will not act [in ways] that contradict my faith just in order to please the people. ... We say to the Christians, convert to Islam or pay the jizya, otherwise we will fight you. The Shariah is not based on logic but on divine law. That is why we oppose universal, manmade constitutions." Please note these next comments made by Sheik 'Adel Shehato. I quote, “A worldwide Islamic kingdom, he explained, is a given. "Of course we will launch a campaign of Islamic conquest throughout the world. As soon as the Muslim and Islam control Egypt and implement the Sharia, we will turn to the neighboring regions, Libya and Sudan to the south. All the Muslims in the world who wish to see the Shariah implemented worldwide will join the Egyptian army in order to form Islamic battalions, whose task will be to bring about the victory … He said international relations will be simple. "There are Muslims and there are infidels. We will have ambassadors in every country. We want to call all other countries to join Islam, and that will be the task of the ambassadors. If [they] refuse, there will be war," he said. For one thing, the Sheik pointed out South Sudan because in July of this year South Sudan just became a new nation. South Sudan is a Christian nation which has just made full diplomatic relations with Israel of which the Sheik hates. The Sheik also knows that there is no way that Israel will ever bow to Islam. Sheik ‘Adel Shehato knows he will go to war with Israel, but this isn’t new news for the Christian as the we knew what was going to take place before it happened. As I said, the news is loaded with the last days signs of the coming Psalm 83 war. I figured that since Egypt has pointed to South Sudan you need to know that South Sudan is not taking a stance againt Israel. In fact, this next report will show you that South Sudan has done exactly what the Prophet Isaiah told us they would do. I quote, “South Sudan "supports Israel and strengthens it as UN September declaration approaches," South Sudan's foreign minister, Deng Alor Koul, told visiting Israeli MK Danny Danon (Likud). Danon asked Koul to vote against a UN General Assembly resolution that would recognize the Palestinian Authority as an independent state called Palestine. "Palestine" is the English version of the name the Romans gave the province previously known as Judea after they succeeded in quashing Jewish independence there nearly 2,000 years ago. The PA "stops short at nothing in its efforts to damage Israel and make sure that the conflict in the Middle East goes on forever," MK Danon told his hosts. South Sudan's President Salva Kiir told Danon that Hamas chiefs Khalid Mashaal and Ismail Haniyeh had approached him and requested that he refrain from diplomatic ties with Israel. They said, among other things, that Arab countries have no ties with Israel. Kiir said that he told them that he "sees Israeli embassies in Jordan and Egypt and that in any case, South Sudan is not an Arab country." He told Danon that his country would establish its embassy in the city of Jerusalem, rather than in Tel Aviv, like most countries. He also promised to visit Israel soon, in response to Danon's invitation. The South Sudanese Parliament's Deputy Speaker Daniel Awet Akot told Danon that when his country celebrated its first independence day, two months earlier, Israeli flags were hoisted alongside South Sudanese ones, as a token of appreciation and a will to emulate the Jewish state. "Israel is like Southern Sudan's older brother," he said. How anyone who reads this news and tells me God is not real is beyound me? Prophecy Sign: Matthew 24:7 the Lord told us to keep on the watch for many earthquakes. In Luke 21:11 He warns us "great earthquakes" would also be a sign. If you are new to my site, keep this in mind. The sign of earthquakes was to appear at the same time all the other signs were taking place. This has never been the case in any other generation expect ours. It is no coincidence all of these prophecies are all taking place in one single generation. We have reached the last days! Here is a list of the quakes that hit today so far. You will notice there was another huge quake which hit a 6.8. Prophecy Sign: Luke 21:25 tells you to watch for the seas and waves roaring. Would Keith Dickerson, and Michelle Hall please contact me. I have a message for you both. Prophecy Sign: One thing I have learned since Jesus put me in this ministry is that you can count on every word He warns us about for these last days to come to pass. Most of you who have been coming to my site will know I have been warning you the European Union is going to go through a major economic shift. Here is one of my warnings from my June 29, 2011 post. Prophecy Sign: Daniel tells us when the revived Roman Empire returned it would have troubles, and would not adhere. I quote Daniel 2: 41-43. “Whereas you saw the feet and toes, partly of potter’s clay and partly of iron, the kingdom shall be divided; yet the strength of the iron shall be in it, just as you saw the iron mixed with ceramic clay. And as the toes of the feet were partly of iron and partly of clay, so the kingdom shall be partly strong and partly fragile. As you saw iron mixed with ceramic clay, they will mingle with the seed of men; but they will not adhere to one another, just as iron does not mix with clay. First of all, for all the new people at my site today, I can assure you that the European Union is the revived Western leg of the old Roman Empire. I have always said, when the economic chaos strikes, and the world it tossed into the worse depression it has ever seen, that will be the time the Antichrist will rise up from with in the revived Roman Empire. Since the EU is the Western leg of the old Roman Empire we need to pay attention to what is happening with the EU, just in case this is the leg Jesus is pointing to. One thing is very clear to us, the EU is in serious trouble and just as Daniel warned in the prophecy we see the EU is not adhering to one another. We also see some of the nations in the EU are really strong, such as Germany, and we also see nations that are fragile such as with Greece. Greece could be what begins to break up the EU into smaller parts. If you came to my post yesterday you saw the news video concerning the rioting going on in Greece over Greece’s financial state. Today Greece has to vote, on keeping the State going or to fall into default. The news from the euobserver will explain” (end of my June 29, 2011 quote). Most of you know that September 28th and 29th this year is the Feast of Trumpets. This is the Feast the Lord will be returning to take His bride away to heaven. The question is what year on this Feast will it happen? Listen to what I am saying please. I am not telling you Christ will come for sure for His Church this September 2011!!! What I am saying is, it is a possibility that that it could happen and the believers need to be on the watch as Jesus asked us to be just in case this is His appointed time. You’re probably asking what does this have to do with what is happening in the EU and Greece? There is no doubt in my mind that the world economic crisis that everyone has been watching is going to take a turn for the worse. As I said in the past in order for the world to grant one man full control of the entire world’s economy there has to be a economic crash. I believe what we are now seeing take place in the European Union is part of this coming crash. What I find interesting is the timing they think the crisis will make a turn for the worse. “A more severe crash than the one triggered by the collapse of Lehman Brothers could be on the way, according to alarm signals in the credit markets. There are a lot of things that are suppose to talk place around the Feast of Trumpet this September that is causing those on the watch for Christ to pay special attention. Here is what will be happening. By the way, those of you who have been coming to my site will have read the news reports on each one of the subjects I am about to list. 1.Israel is suppose to attack Iran’s nuclear power plant in September. 2.The PLO will be in front of the UN during the Feast of Trumpets to call for a PLO State inside Israel. 3.Both Israel and the PLO are now preparing for war in September. 4. Egypt is going to vote for their new leader in September that will put a new government into place who will be opposed to Israel. 5. Comet Elenin will be closet to Earth on the Feast of Trumpets this September. I guess you can now see why those who are standing on the watch for Christ’s return for His Church, (the Bride), have taken a extra alert during this Feast of Trumpets. Now that you have read today’s news, below is what I wrote you on my June 13, 2011 post concerning Egypt. Can you now see what is about to happen? If not yet you better keep reading! Everyone who doesn't believe in the Word of God is about to get a wake up call for the Lord. Egypt is in the process of getting ready to fulfill their part in the Psalm 83 war. I am amazed at how close were are to seeing Jesus Christ return! Prophecy Sign: Signs of the coming Psalm 83 war. On my May 20, 2011 post I warned you to watch for the following. I quote . Now read the news today that points to what I warned you. I said this before but I want to say it again. Get ready everyone to see the fulfillment of the Psalm 83 war very soon! Prophecy Sign: Matthew 24:7 and Luke 21:11 speak to us about watching for many earthquakes and the "great earthquakes". I told you that I wouldn't be posting for 6 days so I can prepare for two main interviews coming up and to finish my newest up-dated book. However if something major happened I would point it out. Since earthquakes hitting a 7.0 is a major quake I wanted to point this out. As I said in my previous posts I will again leave the red flag up to warn that even greater quakes than this are coming soon. I am not going to have time to write an explain in detail what is happening as I need to prepare for the interviews, but below are some of the news reports pointing to prophecy and current events. The ShadowHawk is a 50lb mini drone chopper that can be fitted with an XREP taser with the ability to fire four barbed electrodes that can be shot to a distance of 100 feet, delivering “neuromuscular incapacitation” to the victim. The drone can travel at a top speed of 70MPH and can operate for 3.5 hours over land and sea. The Sheriff’s Office of Montgomery County, Texas was recently awarded a grant by the Department of Homeland Security for a squadron of ShadowHawks. Uncertainty and volatility are likely to feature in global financial markets for years to come, Australian federal Treasury secretary Martin Parkinson warned on Wednesday. He said the troubles facing Europe and the U.S. would weigh on the world economy, and domestically, for many years. Rating agency Moody's has cut Japan's long-term sovereign debt rating, citing concerns about the size of the country's deficit and borrowing levels. The French government is set to unveil measures to achieve billions of euros in fiscal savings as it struggles to adhere to its deficit cutting targets and keep markets at bay. Meanwhile, the euro is breaking down and Europe's debt crisis is holding back the US economy, former US Federal Reserve chairman Alan Greenspan said Tuesday. Israel-Egyptian frontier units went on peak alert Wednesday night, Aug. 24, following specific intelligence that Palestinian Jihad Islami was preparing to launch another cross-border terrorist attack on Israel from Sinai. 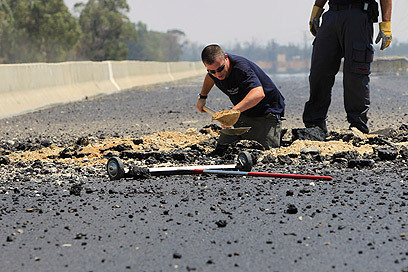 Toddler lightly injured after rocket hits private car; Iron Dome intercepts rocket over Be'er Sheva after member of Islamic Jihad killed in IDF strike. Turkey has informed the US that Israel’s refusal to apologize for the IDF operation to thwart last year’s Turkish flotilla bringing supplies to the Gaza Strip will not go unpunished. The Chinese Middle East envoy to the peace process, Wu Sike, transferred on Wednesday a message from the Chinese leadership confirming China’s full support for the Palestinian UN bid in a meeting with Presidential General Secretary, Tayyeb Abdul Rahim, in the presidential headquarters in Ramallah. Under the slogan “Knocking on Jerusalem’s Doors,” Palestinian, Israeli and international activists are planning to march to Jerusalem on Friday from four Israeli army-manned checkpoints separating the city from its West Bank environs, according to a press release. It said that the Olive Revolution, a popular non-violent movement defying the Israeli occupation, called for the march to protest Israeli closure of Jerusalem to Palestinians from the West Bank and Gaza Strip, particularly those wishing to reach it to pray at Al-Aqsa Mosque in the Old City during the holy month of Ramadan. Head of the Atomic Energy Organization of Iran (AEOI) Fereidoon Abbasi announced that the country has successfully tested the turbine of the reactor of the Bushehr nuclear power plant, and said the plant is reaching full power generation capacity. The Iranian Armed Forces' Headquarters in a statement said that ongoing revolutions and popular uprisings in the region have prepared the grounds for the creation of a comprehensive Muslim front to clinch a final victory over the Zionist regime and free the holy Quds (Jerusalem) from the Zionist occupation. For the next 6 days I will be working on my book and doing things I haven’t been able to do because, I put close to 10 hours a day getting ready to give all the information out to everyone. I have more live interviews coming up from Africa, and now I will also be interviewed on a another national radio show September 14, 2011 that I have to get ready for. I will watch the news and as usual if something major happens I will post the information. For the next 6 days I recommend you all seek Jesus concerning this September. If ever war could bring out it appears September would be that month. You will see why when you read my post! Please, make sure you watch the video on the comet Elenin. This is the best video I have watched that is pure science. I plan to have another phone conference in September as well for anyone interested. Thank you all for allowing me in your life to hopefully strengthen you all in Christ Jesus. It is my prayer that many will find this site and give their life over to Jesus for salvation. Information you may want to know about the Comet Elenin, the science, and at the same time we are told that Israel will attack Iran in September. 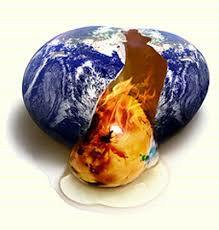 "The world is just one misstep away from a complete financial, economic and geo-political meltdown. Though the mainstream voices have calmed their reports of middle east conflict amid the debt ceiling and negative economic development in the US and Europe, military intervention in Iran has not been taken off the table. Robert Baer has had a storied career, including a stint in Iraq in the 1990s where he organised opposition to Saddam Hussein. (He was recalled after being accused of trying to organise Saddam’s assassination.) Upon his retirement, he received a top decoration for meritorious service. Baer is no ordinary CIA operative. George Clooney won an Oscar for playing a character based on Baer in the film Syriana (Baer also wrote the book). He obviously won’t name many of his sources in Israel, the United States, and elsewhere, but the few he has named are all Israeli security figures who have publically warned that Netanyahu and Defense Minister Ehud Barak are hell-bent on war. Prophecy Sign: Here we go again. 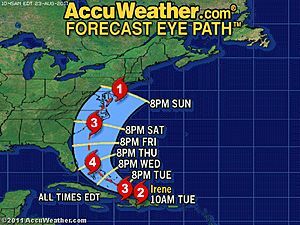 Hurricane Irene has changed from a category 3 to a category 4 and is going to slam into the US. Keep these words spoken by Christ in the back of your mind as you read the news today. Jesus told us to watch for the “roaring of the seas and waves” (Luke 21:25). “The latest projected path of Irene takes it over eastern North Carolina as a major hurricane this weekend, posing a severe threat to lives and property. Given the setup in the atmosphere as well as where hurricanes have traveled from similar starting points, negotiating the Antilles, Irene may take a path similar to or east of Hurricane Bertha in 1996. The difference between Bertha and Irene is that Bertha was a Category 2 hurricane at landfall. Irene should come onshore over the Carolinas as a strong Category 3 hurricane.” Now I know what many of the unbelievers are going to say. “There have always been hurricanes, but that doesn’t mean Jesus is coming back, or we are in the end times”. You are dead wrong about this. This is why. For the first time in any generation this present generation is witnessing everything Jesus said would be taking place all at the same time. This has never happened before and it is a sign to all the believers to get ready to go home with Christ. Prophecy Sign: Ezekiel chapter 38 is one of two wars that have not yet been fulfilled. The Ezekiel war will come after the Psalm 83 war, but we see the nations who will be invading Israel in the Ezekiel war lining up to fulfill prophecy. For years I have been watching Col. Muammar el-Qaddafi thinking he would be the leader who would join up with Iran and Russia, Turkey, and the other nations listed to attack Israel in the Ezekiel war. It appears Qaddafi who hates Israel will not be the man who takes Libya into battle against the tiny nation of Israel. Yesterday I showed you news that Qaddafi went into hiding because his forces were defeated. 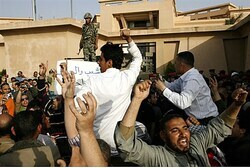 Today some fighting resumed but Qaddafi’s leadership is all but wiped out. Yesterday I showed you who was in line to take over the rule in Libya. The lead man at this point is Abdul-Hakim al-Hasadi, who, as reported on PJM, has admitted to fighting on the side of al-Qaeda and the Taliban. Most of you should know by now that al-Qaeda and the Taliban are religious organizations that enforce strict Islamic Sharia law. Most of you should know by now these are also the people who hate Israel and have been working to destroy the State of Israel. What does all this mean? “US policy towards Libya has confused the aim of stopping Libyan-inspired terrorism with that of overthrowing Gaddafi, and is based on a false picture of the domestic situation in Libya. Describes the economic status of Libya and its political organization. The regime should be left to its own 'self-destruction'.” First of all the New York Bureau Chief hit the nail on the head, as we have just witness the down fall Qaddafi, but that not the connection I really want you to see. Read this part of this report from 86/87, and I will connect the dots for you. “U.S.-Libyan relations have come "pretty darn close" to war, Secretary of State George Shultz said recently. In 1981, just four months into office, President Reagan closed Libya’s embassy in Washington, citing Colonel Muammar al-Qaddafi’s support for international terrorism. Shortly afterward, U.S. navy jets shot down two Libyan warplanes after being fired upon by them. American pressure reached dramatic intensity last April 15 with the bombing raid on Qaddafi’s headquarters and home in Tripoli. Later, some officials sought to destabilize Qaddafi with deliberate plants of disinformation.” Right after the US bombed Qaddafi’s home, Qaddafi began a dormant state of his rule. Qaddafi stopped attacking nations who did not hold his views, and in 2004 Qaddafi gave up his nuclear weapons program to prove to the US and the world he was no longer a terrorist nation. So, from 2004 to the present time Qaddafi left his old enemy Israel alone. Now that Qaddafi is no longer in office we need to see what type of government will take over. I already showed you who is the front runner. What I can tell you is this, knowing that God told Ezekiel Libya would be one of the nations who will in fact attack Israel, we can be confident the next government who comes into power will not only hate Israel, but unlike Qaddafi who held back against attacking Israel, the new government will work to destroy Israel just as we see in Ezekiel chapter 38. Now, for the connection! The rebels who have been fighting against the Qaddafi rule have been doing so under what they believe will be a new Libyan constitution when Qaddafi was gone. A new report gives us some details about this that you will find very interesting. I quote: “As both the Morning Bell and Washington in a Flash noted today, Heritage Fellow Jim Phillips recently pointed out that Islamist forces “appear to make up a small but not insignificant part of the opposition coalition,” and must be prevented “from hijacking Libya’s future.” Parts of the draft Constitution allay those fears, while others exacerbate them. Much of the document describes political institutions that will sound familiar to citizens of Western liberal democracies, including rule of law, freedom of speech and religious practice, and a multi-party electoral system. Do you understand what this means? This means that if the new government is based under this Islamic Sharia law it will mean that the next leader who takes over Libya will no doubt follow this law, and be compelled to act against Israel of whom they hate, and have been working to not only wipe out the Jews, but to reclaim East Jerusalem. Qaddafi was bad, but as I said he left Israel alone but with the new government that is coming in all that will change now. The road to the Ezekiel war of which Libya will play a major rule in has just taken another huge step in setting up for the fulfillment of this prophecy. Below you will see one of the first pages of the soon to be Libyan constitution. What does the nation of Libya and Egypt now have in common? They are both moving in the direction of governments backed by Islamic Sharia law and people who have Israel in their sites to destroy her. Look how fast things changed in Egypt! Just 8 months ago Egypt had a peace treaty with Israel in tact and were friendly towards each other. Now that a new government is going to be formed, and it appears will be under the Muslim Brotherhood, look what one of the head clerics stated concerning the Jews. “A senior cleric in the Egyptian Muslim Brotherhood has declared that ordinary Egyptians are obligated to kill 'Zionists' whom they encounter. According to Arutz Sheva Arab affairs expert Dalit Halevy, the pronouncement is part of a general wave of incitement that directly endangers Israelis who are currently in Egypt. This follows Muslim Brotherhood calls to end the peace treaty with Egypt and threats to kill Israel's ambassador if he does not leave the country. Although there are many benefits for Egypt if it continues its relations with Israel, not the least of which is continued American aid, that is not always what counts in the Middle East where hatred is often stronger than logic.” There is one more important thing that Egypt and Libya have in common. Both Egypt and Libya are going to be destroyed when they make attempts to wipe Israel of the map! God is not going to allow the Psalm 83 war, or the Ezekiel 38 war to be victorious for either Egypt or Libya. For that matter, all of the nations to try to take out Israel in both these wars will be defeated. I am telling you before it happens because this is the message God give me via His Word in Psalm 83 and Ezekiel 38-39. All I am doing is repeating what He said in the hope that you will believe what He has warned us. Here are more signs for you that the Ezekiel war is heading toward us. TRINIDAD, Colo. (AP) - The largest earthquake to strike Colorado in almost 50 years has shaken hundreds of people near the New Mexico border. The magnitude 5.3 earthquake was recorded at about 11:46 p.m. MDT Monday about nine miles southwest of Trinidad, Colo., and about 180 miles south of Denver , according to the National Earthquake Information Center in Golden, Colo. The quake followed two smaller ones that hit the area earlier in the day. So you don’t want to listen to my warnings to pay attention to Jesus’ warning? The US is shaking today. The East Coast just got hit weith one of the biggest quakes that have had. Here is the news just in, but please watch the news tonight and you will be able to see the coverage, this is a big deal as this area of US does not rock that often as they did today. WASHINGTON — A 5.9 earthquake in Virginia today shook Washington, D.C., New York City, North Carolina, and rattled residents in Michigan. The Pentagon was being evacuated today. Reports via Twitter exploded with accounts of shaking buildings in Washington, New York City, all the way to Ann Arbor, Lansing, Allen Park and Detroit. The U.S. Geological Survey put the magnitude at 5.9 on the Richter scale, and said it occurred four miles from Louisa, Va. The quake was felt most immediately on Twitter, where tweets exploded in the moments after the quake. Here are the quakes that have hit just in the past 7 days. Prophecy Sign: The down fall of America is not mentioned any where in the book of Daniel. Fact is, America is not even given once sentence in the entire book of Daniel. This is very odd since this is where the Lord out lines all the world empires that will rise and fall from the time Daniel was alive all the way to the Lord’s second coming when the revived Roman Empire is standing. Ask yourself why is the case if America is suppose to be a major world power? We would live in this generation can now see why Daniel wasn’t given any information about the US. The lack of information gives us volumes of knowledge and that knowledge tells us that the reason why the US was not given one sentence was because they would not be of any influence as a mighty power during the last days. Since America was a major player on the world scene, we know that something must of happen to cause the US to fall from power. We are watching the events that are bringing down America. Here are a few of those signs. I quote,”Using food stamps have become very common in many parts of the United States.” “The United States has gradually become a food-stamp nation as high costs and lower wages make the lives of average citizens more challenging. According to a recent report published by Reuters on Monday, there are over 46 million people in the US living on food stamps, which means that about 15 percent of the country's population can only afford their living expenses through government handouts. The figure indicates a 74-percent rise in the number of food stamp recipients since 2007, just before the financial crisis and a deep recession hit the US, leading to mass job losses. As you can see for yourself, America isn’t so blessing any longer, but the blessing can return if Obama were to turn back and support Israel 100% like most US Presidents before him have done. However, don’t look for this to happen any time soon. Why am I saying this? Because Obama who claims to be a Christian is doing the exact opposite of what God’s tells us to do. As long as he keep this pattern up the decline of America will keep speeding up as well. Since May of 2011 the US went from 12 percent to 15 percent of the country's population can only afford their living expenses through government handouts. The US went from 45.8 to 46 million Americans forced to used the food stamps. While these stats were going up we have seen America get slammed by huge storms, massive flooding, and now some major earthquakes that just hit the East Coast and one in Colorado which was the worse since 1967. Now a hurricane is going to sweep the East Coast and think about this, the 5.9 earthquake rocked Obama land, and Irene is also heading for Obama land. Think God is up set with the US for coming against Israel? When I refer to Obama land I am speaking about Washington, D.C. area. “In the Washington, D.C., area, parts of the Pentagon, White House and Capitol were among the areas evacuated. All memorials and monuments on the National Mall were evacuated and closed. Remember the change everyone was asking for during the last election? Many Americans looked to Obama for the change and you got it alright. You got a man who has been working as hard as he can to do what the Lord said not to do. You may think I am crazy but I promise you all the Lord’s curse is real and we are seeing the affects of this curse on America under the Obama rule. Take a look at the numbers. “Swallow all liquids in your mouth before reading any further. Updated numbers for the national debt are just out: It's now $14,639,000,000,000. When Barack Obama took the oath of office twice on Jan. 20, 2009, CBS' amazing number cruncher Mark Knoller reports, the national debt was $10,626,000,000,000. That means the debt that our federal government owes a whole lot of somebodies including China has increased $4,247,000,000,000 in just 945 days. That's the fastest increase under any president ever. Remember the day the Democrat promised to close the embarrassing Guantanamo Bay Detention Facility within one year? That day the national debt increased $4,247,000,000. And each day since that the facility hasn't been closed. Same for the day in 2009 when Obama flew all the way out to Denver to sign the $787 billion stimulus bill that was going to hold national unemployment beneath 8% instead of the 9.1% we got today anyway? Another $4,247,000,000 that day. And every day since, even Obama golfing and vacation days. Same sum for the day Obama flew Air Force One nearly four hours roundtrip to Columbus, Ohio for a 10-minute speech about how well the stimulus was working in the politically crucial Buckeye state. Ohio's unemployment rate just jumped to 9% from 8.8% anyway. Keep these numbers in mind when you go to the polls next time. Of course by the time you are ready to vote most of you will probably be looking to shop at the thrift stores because your life under Obama has fallen apart. Think God’s Word isn’t connected to what happens to the nations? Your about to find out just how connected it really is, and I promise you who live in America, you aren’t going to enjoy what you see. You want to receive the blessing again from the Lord? Next time you vote just make sure the person you vote for is a person who will stand by Israel no matter what, and that person will not try to divide up Israel. If you bless Israel you will be blessed. Your choice! Will the Lord use a nation like Iran to help bring down America? Iran's religious leader believes so. “The decline and fall of the American empire is unfolding and will usher in a new world order that doesn't include the United States, Iran now believes. With the fiasco in Congress over the debt crisis and the financial and economic turmoil plaguing America, the time is ripe for the "Great Satan" to be displaced, according to the Iranian website Gerdab.ir, which is run by the Revolutionary Guards. "While the U.S. is entering into a catastrophic financial and economic phase," says Brig. Gen. Masoud Jazayeri in a speech to the Guards' ground forces, "Iran can, with a serious offensive, emerge economically and financially." Jazayeri, the deputy head of Iran's Joint Chiefs of Staff, says that while the U.S. has employed all its might in trying to destroy the Islamic Republic of Iran, the Middle East, the region where the "global tyrants focus on the most, is going through transitions whose foundations are rooted in the discipline of the Islamic revolution; in this strategic area of the world, America is regarded all around as the most hated government and country." Jazayeri says the United States is facing a slew of crises that will bring it to its knees, including being thought of as the most in-debt country in the world. Racial, financial, political and social discrimination plagues American society, he says, and immorality and profound family deterioration are among the hundreds of other social challenges plaguing America. Prophecy Sign: Daniel 12:4 warns us that our generation would become known for two specific things. One of those things is that we would increase in knowledge. Could the increase in knowledge help bring on the fulfillment of Bible prophecy and the second coming of Christ? I think you will find these videos interesting. The bottom line is this. We are the generation who has fulfilled this prophecy, and it is the same generation who has fulfilled the signs of Noah’s generation as Christ points to in Matthew chapter 24. “DARPA calls its project "BioDesign," and in its 2011 budget, the agency explains it "eliminates the randomness of natural evolutionary advancement primarily by advanced genetic engineering and molecular biology technologies to produce the intended biological effect." Horn says the real purpose has to do with immortalism. "DARPA has an interest in figuring out how to get around the decaying process of cellular life, and they use the term creating an immortal organism," he explains. "But it's more than just an organism. They consider it to be potentially a lethal force that can be used in military application. "Wired Magazine actually referred to it as a living, breathing creature. And DARPA admits that the force of this living creature, this immortal organism, could be so potent that it ought to also have what they call a 'kill switch' introduced into its organism so that in case it gets out of hand, we could throw the switch and stop it, or if it became available to our enemies, we could throw the switch and stop it." A link to a mp3 of Science Friday a weekly science show product by national public radio This is a discussion they had on about a week ago on what the very near future will be like. Prophecy Sign: In Ezekiel 38 you will find that Libya is one of the nations God warned us about that would join forces with Russia, Iran, and the other nations mentioned in Ezekiel 38. Gaddafi has had a long record of standing at odds with Israel. Why is this time so important to watch? Who ever takes over for Gaddafi will no doubt end up taking sides against Israel. This has to be the case because God named Libya in the coming attack against Israel. We already saw what happened in Egypt were Egypt's President was friendly with Israel,now he is gone, and already we have seen signs Egypt is moving away from the friendship treaty Israel had with Egypt. We just witnessed the border attack between Egypt and Israel this past week, so we know things are breaking down between these two nations. 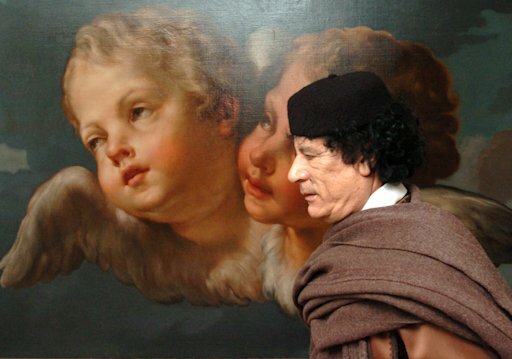 I will be keeping my eyes on the news as to who may take over for Gaddafi? All I can tell you is what God warned us, at the end of the day Libya will march against Israel. Knowing this, it stands to reason that the next leader will be leaning towards an Islamic government that will be friends with Iran. Let's watch and see what happens? Here is also something to consider. Russia has a huge Naval base in Libya so again it will stand to reason that the next government will be super close with Russia. (Reuters) - Muammar Gaddafi, who for decades enjoyed strutting before the public in his finery, has disappeared from the stage as rebels take over his former stronghold Tripoli. The rebels want to get their hands on him and so does the International Criminal Court. But they must find him first. Gaddafi has not been seen in public since mid-June. His foes speculate he may not be in the Libyan capital or even in the country. As rebel fortunes have risen, his long televised speeches at boisterous public meetings have given way to scratchy telephone appeals from unknown hideouts. Over his 41-year-rule, Gaddafi created a personality cult, with his image festooned in banners and posters all over Libya and his philosophy spelled out in a 'Green Book'. He presented himself as a father of the nation and, on the international stage, a warrior against colonialism and a campaigner first for pan-Arab and then pan-African interests." Now, is there any hints at all what I am warning you about the coming leadership becoming an Islamic rule with Libya? Read the next report and you will see there is. Abdul-Hakim al-Hasadi is a rebel fighter in Libya. Now can you see what is coming? Abdul-Hakim al-Hasadi, who, has ties with al-Qaeda and the Taliban of which hate Israel, is one of the people leading the way to take over Libya. Ezekiel 38 is going to be fulfilled just the way the Lord showed us, and if its not Al-Sadi who takes office it will be a new leader who wants to wipe out Israel. At this point it is time to take a look at what is happening with the PLO in the Gaza? As you know, or may not know, the PLO in the Gaza are also listed to attack Israel in the Psalm 83 war. As I warned via the Word of God the signs of this coming war are every where and tensions between Israel and the Arabs is rising. Those of you who have been coming to my site remember me warning everyone that the rockets will not let up, as Israel's enemies are looking for a war. As we begin the new week it is a remake of last week and PLO rockets are raining down on Israel from the Gaza again. Right now the Israeli Government is talking about another invasion into the area that is launching these rockets. I quote, from a report entitled, “Ground operation in Gaza possible”. “Knesset's Defense, Foreign Affairs Committee tours rocket-riddled south. 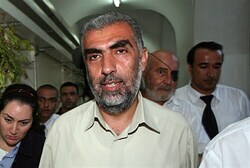 MK Mofaz: Israel must change equation with Hamas. Vice Premier Shalom: All military options viable Maor Buchnik"
"Vice Premier and Minister for Regional Development Silvan Shalom toured the south on Sunday, as Gaza Strip's terror group continued their nonstop rocket fire on the area's communities. Shalom addressed the escalation in the south during a visit to Soroka University Medical Center in Beersheba, where he looked in on those wounded in Saturday's barrage: "The deterrence of has exhausted itself. We'll need to respond, and we're not ruling out the possibility of a ground operation," he said. "We cannot abide this situation, where a million Israelis are under the costant threat of rocket fire." "It's not right that over one million citizens cannot go about their normal lives. We must change this equation, where Hamas tells us what to do, because this past week's terror attacks are some of the worst the State of Israel has ever known." Do you suppose the PLO has planned this attack just prior to the PLO going before the UN in September, when they will ask the UN to recognize a PLO State inside Israel? The PLO has a plan to step up these attacks in hope that Israel will invade them. The PLO knows that the world's media is on their side. When Israel invades the Gaza to stop the rockets, the PLO will cry out to the world saying, can you see how Israel is killing people who can't defend themselves? Of course this type of news will encourage the other Arab neighbors to want to come to the PLO's aid. If this happens we could see what caused the Psalm 83 war to begin! Then again it could turn out to be a huge birth pain, and calm down only to start again in September if the UN doesn't take the step to declare a PLO State. Sit tight everyone, I don't think we are going to have to wait very long to see how it turns out. Prophecy Sign: Does anyone recall when all these last days signs were suppose to take place. Didn’t Jesus warn us in Matthew 24:37 the following: “But as the days of Noah were, so shall also the coming of the Son of man be.” During Noah’s generation people turned away from God. Our generation has become a carbon copy of Noah’s generation. Here is a prime example of what I am talking about. Since everything Jesus warned us about is happening all at the same time shouldn't you question what is going to happen to you if you haven't received Jesus as your Lord yet? I am positive the people clinging to Noah's ship who were trying to keep their heads above the water wished they listened to what God told Noah about passing judgment on a world of unbelievers. It's about to happen again only this time the judgment will last 7 years. Prophecy Sign: IITimothy 3:1-4 is where we see what people will be like in the last days. Watch the video below and see an example of what Timothy was warning us. By the way what you are going to watch is spreading to other US States. Prophecy Sign: Talk about hand writing on the wall? We can see via the sky rocketing prices of gold and silver that this generation is well on the road to fulfilling Revelation 18:12 where Jesus shows us the people will weep over their lost gold and silver when He takes it away from them. Each week now we are witnessing new records and the paper currencies lose confidence. Will gold and silver keep going up? I would say before it is all over you may see gold hit over $3,000 $5,000 an ounce and silver over $100,00 an ounce. SAN FRANCISCO (MarketWatch) — Gold surged to a record Monday, finishing just below $1,900 an ounce amid ongoing concerns about the health of the global economy and talks U.S. officials may offer a fresh round of economic stimulus. It is true that NASA is telling us Elenin is nothing to worry about. However, I found it interesting in the video below points out that NASA will be doing a special tracking. Each one of us will have to determine what is truth and what is not. Since the video points to some interesting facts I wanted to post this information for you. More prophecy news coming today.